BOYS SOCCER Mt. Baldy league motivates the boys to refine their skills on both ends of the field. 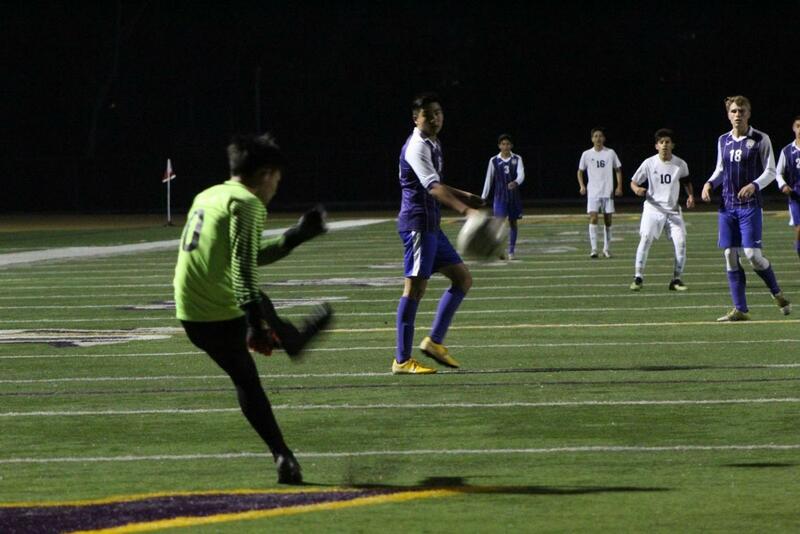 Junior goalie Ethan Lu clears the ball to his teammates in the match against Chaffey, which Diamond Bar won, 1-0. The Diamond Bar High School boys soccer team has established a firm grasp on how to succeed in the Mt. Baldy League. The boys are currently 9-7-2 in the season and are playing against Ontario today. The team is still working on improving movement off the ball and finishing their shots properly. Ritchie also feels the team needs to improve in putting away goals when given the opportunity to do so. “Our offense has many opportunities to score and we really need to put those chances away when we are given them,” Ritchie said. However, with the boys’ ability to create multiple opportunities for shots in a match, the majority of the team’s wins before and during the league have been been won by large margins. They defeated Cerritos 6-2, Chino 3-0 and Ontario 3-1. In the Ontario Christian Tournament, the boys went 1-3, losing to Troy, Riverside Prep and Ganesha. In the game against Ganesha, the team lost in a shootout, 4-3. “We just didn’t play very well. We gave up some bad goals early in both games and after we gave up bad goals early we couldn’t recover,” Wells said. Wells still has high expectations for the team despite their performance at the tournament. “Hopefully getting some players back and a little more focus and drive for winning league, that tends to be a little more important for nearly every aspect of our game, than just playing in a tournament,” he said.